Key Difference: Samsung has added another tablet to its ever expanding line-up. The Tab 3 8-inch follows the Tab 3 7-inch that was launched earlier in 2013. The tablet comes with an 8-inch TFT capacitive touchscreen that offers approximately 189 ppi pixel density. The device comes in three different variants: Wi-Fi, 3G and 4G. 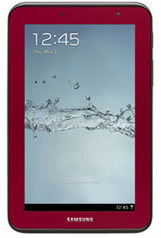 The Samsung Tab 2 7.0 is a 7-inch tablet that offers a PLS TFT LCD display, with approximately 170 ppi density. The device is also available in two versions; Wi-Fi only and Wi-Fi + 4G. The Wi-Fi only tablet is powered by a 1 GHz Dual-core processor and is available with the Android v4.0 Ice Cream Sandwich, while the Wi-Fi + 4G LTE tablet is powered by a 1.2 GHz Dual-core processor and comes with Android v4.1 Jelly Bean. Samsung has added another tablet to its ever expanding line-up. The Galaxy Tab 3 8-inch follows the Tab 3 7-inch that was launched earlier in 2013. The tablet is supposed to fill the gap between the 7-inch and the 10-inch tablet. Many are also inferring that the tablet may be launched as a cheaper variant to the Galaxy Note 8. 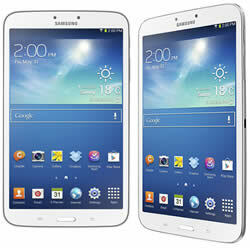 The Samsung Galaxy Tab 3 8-inch comes with an 8-inch TFT capacitive touchscreen that offers approximately 189 ppi pixel density. The device comes in three different variants: Wi-Fi, 3G and 4G. The Wi-Fi model does not offer calling capabilities, while the models do. Other than this major difference the rest of the models are almost the same differing only in weight. All of the variants come with the TouchWiz UI that is found in all of the recent Samsung devices. The device resembles the Galaxy Note 8 in terms of design. It has the same curved corners with a white bezel. There is one hardware button in the middle under the screen that is flanked by two capacitive buttons. A camera and a mic are placed on the top of the display screen along with the proximity sensor. The right side of the device houses the power button, the volume rocker and the USB port, while the left side of the device has the microSD card port. The back has a camera and the LED flashlight. The device is powered by a 1.5 GHz Dual-cored processor; however, the company has yet to announce which processor it is using. Many techies suspect it is the new Intel Atom processor. Galaxy Tab 3 8-inch is available with two different internal storage capacities: 16 GB and 32 GB, which can be expanded by 64 GB via microSD card. All of the variants are available with 1.5 GB RAM. The device houses a 5MP rear camera and a 1.3 MP front camera. The 5MP camera can record 720p video. The tablet comes with Google Android v 4.2.2 Jelly out of the box. The company has also added a bunch of apps that makes the device more user friendly such as Samsung Hub, Samsung Kies, Samsung Kies Air, Samsung ChatON, S Translator, S Travel, etc. The information for the detailed table about the two devices has been taken from Samsung Mobile Press website, Samsung website, pcmag.com, engadget.com and GSMArena.com. GPRS, Edge, WLAN, Bluetooth, NFC, Infrared, USB.